Oh Mr. President…dear sweet precious Mr. President….you see …when you say stuff like this…I just can’t help but think…why- oh why- are you soooooooo divisive. We as a nation have become so polarized and hateful. And the captain at the helm of the ship, fueling this divisive hatred is you. When you make Conservatives out to be the devil…I once again feel obligated to speak up…. Conservatives are NOT against everyone having healthcare. We are against a government FORCING people to have healthcare. We are against the Government playing a bigger role than they ever were intended to! We are against skyrocketing insurance Premiums. We are against much higher prices for prescriptions. We are against the middle class getting hit the hardest by this implementation! We are against being promised that we can keep our plans, but in reality we are being straight up lied to. We are against the pro-choice party allowing for no-choice with this new law. We are against this law being rammed through Congress without any input from the House. I have spoken with Dr’s who think they might have to close up shop due to this new law-for real-awesome-once again killing the small business! 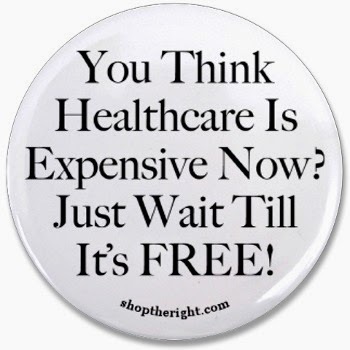 So, let’s just get this out there….This whole thing is set to eventually shut all private healthcare down. Leading to a single taxpayer system run by Government…. Well it means this: let’s say you got a sick child….they need a costly operation …the govt will decide whether it’s ‘worth it’ and then you’ll be told to wait- (Just think the DMV-which is run by govt or The Post Office which is also run by govt) -while your kids life is on the line…..
Or shoot, let’s say your 80 yr old mother needs a transplant of some kind…oh that’s nice but at 80 it’s probably best to just give her a pill and let’er pass…. You see….Conservatives aren’t against helping people who need help-that’s how the left would have us viewed. We have just simply seen the way our Government runs things that should be privatized and it’s scary as hell! Watch out for Pitch Forks!